Not recommended for people with kidney disease or acute rashes. Foods which are easily digestible and do not make wind or gas are good. Vegetable juices and soups are good. Juices of carrot, beat root and cucumber mixed together is also beneficial. Green salad with a dressing of lemon juice and a little salt is also good. Fruits like apples, oranges, grapes and papaya can be taken. Cooked vegetables like squash, zucchini and pumpkin are good. Cooking with spices like cumin, coriander, ginger, asafetida, garlic, fennel and turmeric is also helps a lot. Avoid eating hot, spicy and fried foods, sweets, wind forming foods like cabbage, cauliflower, spinach, broccoli, okra and potatoes should be prohibited. Avoid taking too much tea, coffee, alcohol, white sugar, yogurt, chocolate and cocoa, excessive smoking, sleeping during day time, staying up late in the night and mental tensions like worry, anxiety, fear, stress and grief etc., should be given up. Regular physical exercise and every day massage with oil, once or twice a week, should form an important part of life style. I am suffering from disc buldging and sciatica pain for the last 4-5 years and having pain in my both knees. I am unable to walk and even can't stand for 10-15 minutes. There is a problem in sitting also I am unable to sit and can't even fold my legs. please advice. Regards. i m suffering from joint pain last 8 years, my age is 28 now. the pain still persist. i took medicines, consulted to orthopedic doctors. but no use. is there any solution to get rid with this diesease? dear sir, I am 38 yrs male. suffering with joint pains since last 6 months. First i got attack of gout 2 yrs ago since then gout atacks me 2-3 times. My wife diagnosed arthritis and her age is 45, she had this problem last 8 month.She take 4month aelopathic medicine and stop.Then take 5 month homeopathic medicine but pain.stiffness and swelling increased day by day. she is not happy with this aelopathy. but treatment because of its side effect.she forced to start full ayurvedic treatment. So please suggest me good ayurvedic medicine for her please. In both the knee Ex ray it shows reduction of joint space in medial compartment of both knees joints and patella femoral joints , marginal osteophytes, subchondral sclerosis. My wife aged 43 has been suffering from both knee pain problem and have taken medicine of Ayurvedic,Homeopathy and Alopathey. Earlier she had problem of Arthritis ( Ganthen ) on the back side of her both legs, but after taking Ayurvedic Medicine all (Ganthen) have disappeared. Now there is acute pain in her both knee and Doctor has advised for knee replacement. Please suggest me any Ayurvedic Treatment without operation and complete relief. i am suffering from HLA B27 for last two months.Kindly suggest any solution in unani Medicine. I developed frozen shoulders a year back and I have been using Grocare products to treat my pain. Though it hasn’t reduced the pain altogether but yes, it relieved the pain to some extent. If u can help it would be so kind of you. my Mother is suffering from arthritis ,Hands & legs joint pain for the past five years, can you suggest me what treatment should be given to her & what diet to be consumed. thanking you & awaiying for your reply. My wife is suffering from Seropositive Rheumatoid arthritis since last 1 year. Her Anti CCP-is 732.50 U/mL and RA factor is 109.20 IU/Ml and at present she is taking Homeopathic medicine but not much benefited so far. Kindly suggest any solution and diet to be consumed. thanking you. I am 55 years old , having severe leg pain and foot swelling. my wife is suffering from arthritis ,Hands & legs joint pain for the past few years, can you suggest me what treatment should be given to her & what diet to be consumed. thanking you & awaiying for your reply. mujhe 3 year se ghutno me dard hai 2 saal tak ayurvedic medicine lee lekin chalne me abhi bhi dard hai plz help me age 62 from delhi. thanks. hello sir . mera name yogesh hai our meri age 30 year hai me back pain se 15 saal se paresan ho meri ASO -POSITIVE HAI OR CRP - POSITIVE HAI OUR HLA B27 BHI POSITIVE HAI ; JHANSI KE docter ka khana hai ki meri is bemari ka koi ilaj nahi hai ; aap kai mhuje sahi upai bataye ; kya me kabhi thecknahi ho sakta plz bataye ; plz misscall our message to me my mob no 09795944484 hai . my mom is having very much pain in both knee joints and the pain is increasing so much even she is having problem in walking. mam please advise me what should i do . hello sir, my wife age 28 years suffering with hip joints pain(both sides) and it is in stage 3 to 4 now. doctors said that to do hip joint replacement is there any option to get back normal position with out surgery please tell us wating for ur reply. This is onbehailf of my wife (employee), she is facing Rheumatoid Arthritics since 8 years and did treatment in Ayurveda as well as allopathic and last 3 years she is under allopathic treatment and still continuing, but she didn't get an relief from the disease. Now the problem is that have pain for all joints, especially in shoulders, knee, feet, wrist and fingers. Some days she has feeling fever internally. She is much worrying about this and totally disappointed also. Hence I would request your kind advice about the better treatment for the illness. I have arthritis of the knees which is very painful. I am 54 years of age ..It is three years since I am suffering. My age is 34Year male, facing pain problem, knee pain since 2months, spinal, L5 pain since 10months, please suggest aurvedic treatment. hallo sir my mom is 53 years old and she is a diabetes patient and also suffering from arthritis now she is under treatment and this days she is having her medicines properly and also she has gone through some physiotherapy but still her condition is not good she is facing the same problem she cant walk properly now i am under serious tension sir if u kindly suggest some goo d steps of ayurvedic to cure my mom i will be grateful to you plz sir do let me know about it soon by calling me or mailing me at my email either if it is possible for you to call me at my number i will be grateful to you my number 8697655219,7684039648. My wife Kalpi Rathod is suffering from Rhuematoid Arthritis from the last 6 months. Her RA factor was <8 and Uric Acid was negative few days back.She feels pain and some time swelling in almost all joint. She has started with Homeopathic medicine and now taking Ayurvedic medicine feom the last 3 months. She feels good for 2-3 days but after then she again feel pain. Suggest some medicine or treatment to cure arthritis pain. My sister 34 years old woman,suffring with swelling on face,legs,feets and ankles. how can treat the health problem? My mother age is 56 year Old ,she has sufferers by Arthrits heavy pain to all body joints last 14 yeras .she cannot walk on her foot . I hereby inform you that my mother is 63 year old & she is effected from aurthritise since a long time .Doctor's have say to replace joint. I hereby requested you to kindly advise me to which ayurvedic medicine she use for authritise paid regularly . I am Md. Alimur Rahman from Dhaka, Bangladesh. My mother aged 56 years, living at village is suffering from Joint pain severely from leg,toes, hands, fingers, back and sometimes pain is so severe that she can not walk normally. Please prescribe the best medicine and remedies or changes to be followed in the way of life. Please tell me the way I can send money and send your cell no to talk for discussing more details. muje artheries hai Muje chalne mein kaafee deekat hoti hai or meri age 33 year hai Dr muje report wise sandhivat bol rahe hai or Ayurveda Dr muje Aamvat bol rahe hai lekin meri dono medicin chal rahi hai lekin koi fark nahi hai muje koi upay bataiye.please sir. I have been under allopathy treatment for last 5 years. I am taking methotrexate 15mg once in a week. Please advise how to bring my RA factor to normal range. I'm 66 yrs old, having pain in my knees and heels ... its becomes worse in morning while keeping my feet on floor. enlarge lever. Please help me. My wife aged 46 suffering from arthritis joint pain on knee since 2 years she is using english medicines but no use still pain has increasing she could not walk properly could not climb upstair. her age is 46. So kindly advise prescribe ayurvedic medicines. Sir, I have met with an accident almost 1.5 yrs back.. And I got hurt on my shoulders. Doctor told that no displacement had occur. But it still paining a lot... Pls. Help. Me .. What to do... ??? age 72, having, heart, high bloodpressure., diabities, enlarged lever & prostate. From last one year i have pain in right knee. There was fluid. The Doctor drained that and gave 3 injections. now there is no pain. it is told that after 6 months I will again need Injections. Pl. suggest me life style and some ayurvedic medicine. Thanks. My wife diagnosed arthritis and her age is 32, she had this problem last 8 month.She take 4month aelopathic medicine and stop.Then take 1 month homeopathic medicine but pain.stiffness and swelling increased day by day. she is not happy with this aelopathy. but treatment because of its side effect.she forced to start full ayurvedic treatment. sir,my mother is suffering from arthritis .she is also a gastric patent .she is taking medicine from many places. so,please suggest us what to do. Take FLAXSEED OIL ( ALSI KA TALE ). + Ferrous Sulphate & Folic Acid Tabs. You'd turn 24 from 42. Your pain along with all complaints would go away ! If you have BP/Cholesterol/Heart Problems, then consult your physician. I am 49 years old and my RA Factor is now 264. Earlier in 2010, it was 98 and started taking ayurvedic medicine and it came down to 46. Now over the last several months, I stopped taking any medicine and started feeling uncomfortable. So, tested and found out the reading is 264. My ESR is always normal and latest 10. Sugar / cholestrol level is also normal. What do I do ? My Father suffering from wrist of hands last 1 year. He both hands are paining continue. and of night increasing paining wrist. my father is not left tea cup self hands. no other problem. sir, i am suffering from rheumatoid arthiritis last 3 years. sir i am suffering extremly cronic pain in my hips. My mother suffering from Arthrits from 2010. Her both hands are paining. Morning she is not to fold her hands. After some time means 1 or 2 hrs later her finger moveing. My no is 9987362821 & mail Id is vkbillava@gmail.com. I am aged 40 and i am facing knee problems for the past 6 months. I am 45 and the Cartilage lining the front knee bones on both legs has worn out 50%. The condition is called Chondromalacia Patella. Is there a complete cure? if so can you please let me know what would be the treatment and where is it given? I give Bharatnatyam Dance performances. and I teach as well. is it advisable to practice this dance form. I like to sit and sleep down on the floor? Is that ok? I am 42 yrs old, i am suffering from acute joint knee pain. Doctors has said its arthritis and have advised Physiotherapy and given pain killers and vitamin tablets. i m 42 yrs suffering from knee pain since last 4 yrs; taken ayurvedic,allopathic medicines but all in vain. So kindly advice me for permanent treatment. My uric acid level is 3.3, kindly suggest medicines. I am suffering from this disease for last 30 days, I had no hereditary symptoms of it. Dear Sir or Madam .Please help find out the cost of studding about arthritis rheumotis and ayurvedic at your college. sir,mujhe sandhivat ki pareshani 3-4 varsho se hai.mere hatho,kalai,our gutano me suzan our pain hota hai.har saal esaki shuruvat raning our winnter mai shuru ho jati hai.suzan alternet aati-jati hai.jadya pain shyam se shuru ho jati hai.madicin khane par suzan kucha samay ke liye kam hoti hai our suzan utarne ke baad bohat vickness aa jati jhai. Joint pain ab puri trha se smapt ho jata hai Ayurvedic daba ke duara. mera umar 24 sal ka hai or mai 1 sal se joint pain se prsan tha aj mai bilkul thik hun. ab mai ak NGO ke nihe kam kar rha hu. or kaphi logo ko joint pain se chutkara dilaya hu. ayurved ke allba eska elaeg khi nhi smbhu hai. or app bhi junge. I'm 29 yrs. housewife. I'm suffering from Rheumatoid Arthritis since last 5 years. I've done many kinds of treatment like Alopathy, Homoeopathy etc. and now I'm under Ayurveda Treatment since last 6 months. But still I did not get any permanent relief. Is there any possibility to cure ? Please give me proper guidelines what should I do ? My sister is 54 years old and suffering from Osteoporosis very badly. She has taking medicine from 5 years to continue till date. But now she has swollen and untolerable pain in her joints. she has also Thyroid problem. What will she do for relief please suggest us. We will be very thankful to you. Please give us suggestion to get rid from this disease. I am also 56 years old working lady and I am suffering from Chronic Bronchial Asthma. and also I operated my left eye due to Retina Detached last year in April and still continued my eyedrops and Tab.ARMD. I also take steroid like Predinisol, Wysolone, and inhaler Seretide etc. time to time. Now I feel stiffness in my whole body particularly in shoulders and in Knee and ankles. When I walked I feel so pain in my legs and knee and wrist. Dr. told me that I am also have cervical pain. so please suggest me what I can do for this please please advise me your suggestions. Sir, my mother age 42 is having very severe swelling and pain in her both knees and her joint of backbone with abdomen(disc) is also damaged. Please suggest me some drugs or medicines and precautions and foods to intake and exersices and yogas if required for her speedy recovery. My mother aged 60 years old, having a big gap between shoulder and hand. Very difficult for her to move hand and it is very painful. she cant do anything with her left had due to this. We took here few hospitals and there no change. can you please advise me a treatment for this. My age is 43 years. My mother have rhrumatic arthritis. As same from last two years without any cause my wrist and fingers are suffering from lot of pain and stiffness. My RA factor test result is normal. It is only 0.7 . in spite of this i am suffering from wrist pain. All other tests such as MRI scan, blood, urine are normal. Doctor says it is arthritis. This is Tejas i am 24 yrs, I have been experiencing joint pains all over the body and my body also aches . My blood reports says my CRP is positive. I have joints pains that started in Jan 2014 and I am unable to do any other activates.It is specially in my knees and wrist and lower back. Can you please help me with this. Can you please call me on 8055050111 or you can mail me your contact no so that I can call you. Please Please do reply to this mail.I am waiting for your reply.Please please help me with this. You can mail me on tejaspwr2@gmail.com or call me I will be waiting for your call. My RA is negative and when I went over net it seems like reactive Arthritis please adive me with this sir. my mom is 46 year old fat lady and also suffered in severe joint pain .her weight is 116 kg.can u suggest best ayurvedic treatment to get rid of her problem without surgery ..
i am 35 years old .i am sufferring from soirasies artherities from last 5 years .i had taken elopethy medicince but that is steroieds.recently .can please you sujest treatment for this as early as posible .i am having to much pain on kee and ankle movement is veary less. my wife has been diagnised with Rheumatoid Arthritis for the past 3 years. It all started from pains in the hand fingers which gradually moved on to the shoulders, toes and the rest of the body. Since she was very bad at a certain time we started with allopathy where in she was treated with steroids and later on a weekly dose of metathroxate. This we continued for around two years. And in these two years she never had any signs of pain. It was last year we consulted another doctor, who explained to us the ill effects of the allopathy medicines (which we knew before) she was taking and hence prescribed us some new medicines which he said were a natural nutritional therapy. These were not medicines as such but were food supplements. But with these medicines the pain was there but not severe. But now looks like the pain is gradually increasing. Hence I would like to get some advice from you kind expertise. Thank you for helpful advice. My wife having sypondiloarthitus form her age of sixteen. She having pain in her joints like neck, lower and upper back, spinal cord, hips joints. elbow and knee. Kindly suggest some good treatment for her. I am 40 years old male and living in chennai. I am suffering joint pains in the neck, shoulders, elbows, forearms, fingers nodes and knees and ankles. This has been happening for the last one years. I have taken allopathic, treatment but it vain. Before 2013 i am worked as clerical job. now i am working in factory. 1. Spondyloarthritis, 2. Axial, Osteoporosis, Anexity disorder. Even after Three year treatment under Rheumatology doctor, I am not comfortably sleep. My mother is just (20 days before)Diagnosed with RA. She is having pain in left knee.Local doctor suggested for Ayurveda only. Please let me know your suggestion so that this should not become chronic level. Sir, I am suffering from rumatoid arthritis since last 2 years. M taking alopathic medicines but not getting relief from unbearable pain & swelling . Pl. suggest me any solution. I am suffering for Psoryasis & Psoryatic Arthritis for last 14 years and now I am 52 yrs old. 40% of body Surface area is affected by Psoryasis and wrist joints and fingures are became stiff with pains. Kindly request medicine for permanent cure. I am alchoholic and smoker. sir, i am suffering from hip joint pain and stiffness in same hip mussles.kindly suggest immediate pain reliever and to remove stiffness. doctors suggests for hip replacement, but i do not want to do so.i shall be highly thankful to you. i am a spondylo Arthritis patient suffering from heavy pain my all blood report are coming normal(LFT, CSR, CBC) but HLAB-27 is comming positive. sri please tell me what to do and what not? Dear Sir, Good Morning ! Perhaps I m suffring from Arthirities . According to my doctor i have done some test like - RA, ASO,VIDAL & URIC ACID TEST but all reports are normal. But i m suffring from joint pen, swelling of joints & vans,inactive of arms & fingers,band of fingers.headech.this problem is more when coulds spread over sky. How should i do Sir help me please. Mob - 9669471274. I am suffering from arthritis from last 7 years . Doctor is saying only remedies availiable at this time is knee replacement. pls advice how i can cure my self from Ayurvedic medicines etc. I am also suffering from diabities. two months back started with morning stiffness and rashes on lower part of body which are coming and going. my C-reactive protein is increased to 16. rest all normal. doctor said ... its Circinate balanitis+ and given sulfasulazine 500mg for 3 times a day. but i didn't taken as thinking of side effects. and taken ayurvedic products rheumartho guggulu, maharasnadi kada, dashamularisht ..etc. pains in fingers some how reduced, but rashes are not gone. two fingers (index and middle) in both hands are started slight deformity. so again visited the doctor. this time he said anti arthritis. and increased the dose of sulfasulazine-2 tab per day, paracitamol- 3 times a day, etorixib - 1 in morning. presently i am taking that. but please suggest me... ayurveda medicines.. i want to shift to ayurveda. by thinking of side effects. thanking you sir. I am BABI DAS female (age - 34) suffering from joint pain after 12 weeks of my 2ND delivery. I am not sure if the reason behind my joint pain is arthritis or something else. The pain is un-tolerable while I am getting up from Bed, all most all the joints are paining like I am feeling like dying every morning. So now I am planning to go for Ayurvedic medicine treatment. I request you to please suggest some effective medicine for which I would be greatful to you. Thank you for listening to my difficulty and expecting a kind consideration from you at the earliest. Please feel free to call me (+91 8984692427) or contact me through email if any other information needed. I am 29, most of my joints, shoulders, elbows, wrists, finger joints, knees, chest bone, etc are very week since child hood and have pain in all these joints after little exercise. Many of my movements are restricted. Doctors have time and again failed to diagnose what kind of Arthritis it is. I also have GORD and am on medication since 2 years. Please help me with suggestions and provide your contact details and address so that I can visit you. I am 30 years old, I have lot of body pains currently I am going to baidyanath clinic. they gave me stretchcap,mahayograj guggulu, and karpooradi thailam, the effect is not good, I am taking it from 12 days but still there is no much difference, please help. I am 40 years old.I am suffering joint pains in the neck, shoulders, elbows, forearms, fingers nodes and knees and ankles. If I stand or walk for 15-30 mins max. my legs starts paining, I am unable to move or walk. I need to sit for a while and than start again. This has been happening for the last ONE years. I have taken both allopathic, homeopathic and ayurvedic treatments, but it vain. Would be grateful if you could assess my condition and suggest/recommend some medication or exercise which would bring me back to my old self. Dear Sir, I am suffering from Rheumatic Arthrites last 5 year. I have taken many treatments for my arthrites problem but all in vain. Pls suggest me how can I improve my problem. ment of knee What should I do? my mother is suffering from Arthritis knee joint pain and swelling in whole body since last 15 year. she used medicine in Alopathic but she did'nt fell well. so sir plz suggest me best medicine for that. thanks. I have knee pain from the past 7 yrs, it keeps coming on and off especially doing the cold season. I had taken Ayurvedic medicines and was feeling better, then i stopped it. I am 48 yrs old female. I have knee pain on both the knees but one knee there is lots of pain, stiffness and also i feel the pricking pain like a needle on both the knees. I am taking methi on empty stomach, and having 3 glasses of ginger water, and some mixture of methi seeds, ajwan and kalli jeeri. I also take one capsule at night, ayurvedic, and massage the knees with sesame or mustard oil. How long it will take for my knees to repair. I have trouble walking. I have circulation problem too. My weight is 60 kgs and height 5ft 1inch. Is my weight okay? Kindly help as fast as possible. To add to this my right leg is shorter by 5 mm. I need to dance on week end at temple for bhajans etc. Kindly what ayurvedic medicines will ease my tension. I need to travel to Germany India etc within 3 or 4 months. SIR MY MOM SUFFERING FROM JOINT PAIN, PLEASE GUIDE ME WHAT SHOULD BE TREATMENT TO JOINT PAIN. I have been suffering from quite serious pain in the lower back,thigh and in the knees.I am experiencing these pains after my hemorrhoid operation.What medicine do you advice me to take so that to alleviate those pains. I am 61 years old. Recently I find getting up from floor or after long time on chair/sofa is painful. Also knee and ankle joints are stiff. Can you please suggest the remedy for this problem. I am 28 years old male.I am suffering joint pains in the neck, shoulders, elbows, forearms, fingers nodes and knees and ankles. This has been happening for the last two years. I have taken both allopathic, homeopathic and ayurvedic treatments, but it vain. Please Suggest me best treatment. If you have any joint pain then email me on jatinpatel001@gmail.com. Article Comment I am 60 years old male. I have knee problem since last 6 months. My right side knee pains while walking and there is some swelling on the upper part of the knee joint. It does not pain while squatting (sitting position). My left knee pains while in squatting (sitting position) and needs to be stretched occasionally. I have used several massage oils but not able to get permanent relief. May I request you to suggest me a permanent relief to knee pain? My father suffering pain below the knee, my fathe can't walk long time, he feel there is no part below the knee. He is 65 years old now. He used many medicines but it didnot give any effect. Please suggest a medicine. . . I am Mamta Sharma female (age - 32) suffering from joint pain after 12weeks of my 1st delivery. I am not sure if the reason behind my joint pain is arthritis or something else. The pain is un-tolerable while I am getting up from Bed, all most all the joints are paining like I am feeling like dying every morning. I have already consulted with homeopathy and they also recognized the cause of my pain as vata. I have already continued homeopathy medicine for more than 2 months but no result found so far. So now I am planning to go for Ayurvedic medicine treatment. I request you to please suggest some effective medicine for which I would be grateful to you. Please feel free to call me (+91 9954567022) or contact me through email if any other information needed. my mother, 48 yrs of age, is suffering from arthritis since 4 yrs. she is being medicated by medical doctor and he has prescribed a steroid for her pains which is harmful for the body. And she is also advised to take folitrax 15 injection every week. so please suggest me some Ayurvedic medicine to overcome the disease. my father used to take 'R Compound' an ayurvedic medicine two tablets three times a day for a few years and how he is almost free from RA. Not sure if this will work for you but may be you can try. me. is she suffering from arthrites.? pls send me remedies for the same.rest she has no any pain any parts of the body. Reply soon as possible. i feel highly obliged for the same. I am kadhirvelu.P from TAMILNADU. I am suffering from chronic AVASCULAR NECROSIS beyond third stage in my right hip for the past four years. My age is 39 years. The doctors are advising me to undergo a total hip replacement surgery. The pain is very intense and I could not do my daily activities and unable to walk, sit, stand or climb upstairs in a proper manner.I have undertaken naadi vaithiyam for 6 months but i have no improvement or clarity in treatment. Moreover in siddha treatment i havent got any fine advise with regard to this.So i request you to advise me for my disorder, a permanent solution. Awaiting your earnest reply. Dear Dr. My mom is suffering from arthritis since more than 10 years.. Recently, she developed severe joint pain with swelling and was dragging her leg to move. We admitted her in an Ayurvedic Hospital for few days.. The treatment is good but I wanted to know if she stop taking ayurvedic medicines after few days, will it effect her or revert in future..?? You have published simple home remedies for joint pain.I'm surprised to know that lemon would give fruitful result.Thanks a lot. l thank for useful information. Dr. I have had an arthoscopic surgery of my right knee. But the pain is still persisting.please advice an Ayurvedic treatment. I am 52 years old. I have a right knee pain (right upper side of the knee). My age is 45 yrs. While I was running, I was feeling that my right leg is false for 1-2 seconds. After that I am feeling pain on the right upper side of right knee). Please tell me the causes and treatment for that. Dr I have arthritisof the knees which is very painful. I am 60 years of age and I am Dabeties person.It is three years since Im suffering. Please advice. dear sir,my mother had a hysterectomy 1 year before.now she has very bad joint pain, swelling.can this condition be cured in Ayurveda?are there any risks of heart disease after this surgery?can u suggest a diet for my mom who looks fat now because of edema.pls help me.where should i approach in kannur,kerala for the traetment. Respected Docotor, I am aged 62 years and suffering from pains in both shoulders and unable to bend my both hand fingers and stiffness in hands and legs since two years. I am diabetic since 1985 and now using Insulin and the sugar levels are under control. R/A, factor, ASO, Uric acid are all in normal condition. I approached Ayurvedic docotors in Vijayawada and they have given oil message treatment for 21 days and giving ayurvedic medicines, but there is no improvement. I am prostate(Grade-II) problem and they have given URAL-BPH tablets and there is improvement in prostate problem. I am finding it very difficult to use my hands and legs due to severe pain and unable to sleep. PLEASE ADVISE ME IN THE MATTER. I am 78. Diabetic (under control).Suffering from pain in right knee .Doctor says cartiledge is damaged from one side.I want Ayurvedic/herbal treatment. Pl suggest effective treatment along with some Ayurvedic pain killer. My wife is suffering Rheumatic Arthritis last 10 years. I have taken many type treatment as allopathic, Ayurveda, Homeopathy. now I have take Ayurveda medicine more than five months but no any type relief for pain and swelling. Please sir Kindly suggest any solution early. I am 31 years old and suffering from joint pain in my middle finger of both the hands for the last 4 1/2 years. I am house wife .However there is no remarkable improvement. i am unable to cooking food our family. I would be grateful if you could suggest some remedial measures for faster recovery as I feel, it is an initial stage. i am 42 years old anf suffuring Rheumatic Arthrites from last 2please suggest proper medicine. when i close to take arhokind p400 even one day ,there is very pain in joint. please give me proper medicine. Sir i am recently send a mail about my husband .his age is 39 & he is suffering from RA last one year 7 his RA factor is 384. My husband suffering from rheumatoid athretis.He is suffering from shifting pain in whole body. Please you tell me what precaution should he taken & you tell me about the eating plan.and his pain is sever in evenning time so please tell me your opinion. sir,my whose age is 56 is a heart patient from 5 years,and diebeticsalso,now day he got little infection in his kidneys also,and her both the knees are paining very badly,we visited lots of doctor,but here is noo such relief,ple sugest me something. My father is suffering from Rhuematoid arthrities from past 6 months, earlier he had swelling in both hands and legs. He is recovered slightly there is no much pain in his legs but he is having sever pain in his hands, he cannot use them for any purpose, someone should make him bath, feed him food and put clothes to him. He completely stopped using his hands as it pains a lot. he was taking allopathy from the beginning from past one month he is taking ayurvedic medicines but there is no any improvement as such. can u suggest some other medicines fr my dad also how long does it take for him to recover completely from this? please write back to me sir..
Dear Sir, My father was suffering joint pain my big problem is knee pain pls suggest me how i improve my problum. My father was having approximately 58 years old. He was suffering from joint pain in his both legs.He is looking for best treatment.Any budy knows please tell me once. Everything else is fine but ayurveda has recommended baluka swedanam for arthritic patients not a simple sesame oil massage. Dear, Sir, My left hip joint opretion is sep.2007.And now same problem to me right side so I want your advice.Please,give me advice sir. ka medicin diya.me avhi Arthrites ka medicine le lahahu. but mera koi jaint pain kam nehi hua.krupa karke muju eska tretment bataiya.per ka jaint mein soling hee. I am suffering from finger joint pain in my hands for the last 1 year. kindly suggest me some ayurvedic medicines. sir meri mother ko arthritis hai unhe chalne mein kaafee deekat hoti hai dawa ho raha hai per theek nahi ho raha hai aur body mein sweeling hai.SIR please koi slouation baatiye. My grandfather is 65 years old.He has been suffering from knee joint pains for 10 years,he is uncapable of walking now.So please give some remedies or suggestions or suggest some medicines. Iam Suffering from Rheumatic Arthrites from past 3 years since and i was taking Homopathy treatment but of no use last from last 2 months iam S.Compound & Shothari one capsule each thrice daily with simple water. iam feeling better but still iam suffering from bit joint pains. So is there any tablets that can cure me.. 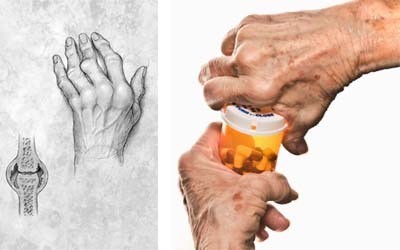 I am 75 and had developed OA of hands, especially corpo-mata carpal joints of both thumbs about seven years ago.Was advised intermittent treatment with NSAIDs such as Ezact, Etoshine/ etoricoxib etc which could manage the pain. However my Creatinine has now reached 1.4 and my physician has advised stoppage of all NSAIDs/ pain killers. Consequently, the pain in thumb joints has resurfaced although not unbearable. I am doing a few hand exercises and have just started taking Tab DOLID 1 BD + Cap. RKS 45 as advised by my Sr Ayurvedic Physician. Please advise and recommend treatment options. Except for taking BP medicine which I am taking since 15 years, I have no other problem, like heart or sugar etc. I am active and walk regularly for an hour daily although I had to stop going to gym due to OA of hands. Thanks. sir, my brother aged about 49 yrs is having lot of pain with swelling in his both the hands which is heavy in the early morning . we have consulted remoutology speclist in bangalore but has blood test for RA . DR has told it is not RA. then he told it is calcium deficiency in the body. Pl advise me the medicines with suggestions. I am 62 years old, and have led a very healthy and active life right till a few months ago. I still go to work in a corporate firm. However my first few steps after getting out of bed, or after sitting for a long time ends in misery. All my joints ache and I am unable to stand without feeling any pain. I require your advice urgently, to stop this horrible joint pain - even on the shoulders. i am 40 years old, i have pain some time in my legsthumb.. dr. says it is rumetide trthrites. what should i do. ? my mother in law suffering from polyarthritis,her both knee as well as her both ankle are swelled severely, joints are severely painful, she make hard even to walk. her age is 51 running ,she is government servant and . want to complete her job.many treatments have been given but nothing works.so please suggest me what to do,her pain increases day by day.if possible we will come there and do her treatment. I am 60 years old.I have Artharities in my both knees.My right leg is now not straight. Pl. offer your valuable advice. Regards, A. K. De/Kolkata. My wife suffering joint pain since last 2 years. therefore I want to visit your clinic can you give me your clinic Adress please. send me ur guidence or contact no. I am 58 years old and suffering from joint pain in my middle finger of both the hands for the last 3 1/2 months. I am applying Mahanarayana Oil once only after dinner.However there is no remarkable improvement. I am a musician and unable to play my Guitar and Keyboards. I am an Ayurveda pratictioner and yes reducing the ama in the body is essential. I am following a lady who has been suffering by arthritis for several years with pain and swollen joints. I did reccomend her a detox and just on the 3rd day of it, she is feeling amazing an painless. I am obviously happy to hear the quick positive result she achieved. And then I will give a Vata pacifying diet. sir, my brother is suffering fromacute joint pain in both hand finguresand also inflamation doing in fingures.pl.helphim. i am suffering from rheumatoid arthritis from 1 yr.i am taking allopathy treatment,but no use.plz any one suggest me which treatment is best for (ayurveda or homeopathy) me. .She is not able to walk . sir, I am 39 years old male. I am diagnoised with left hip joint synovitis with superimposed secondary osteoarthritis. Is there any requirement of surgeris as the allopathic doctors are suggesting . Can we avoid the surgery in ayurvedic medications. I am already taking Rasa Raja Rasa, Trishun, R-compound thricea day daily in ayurvedic treatment for the past two months. But my pain Is not decreased. . Pls we need Your valuable suggestions to avoid the surgery. Thanking U.
actually i am having pain my MADIMALU for the last one year. but i did not care about them. but recently from two months i am getting pain in my fingers of both hands. even i am unable to do my regular work properly and feeling very uneasy and BADDAKAM. i went to NIMS two weeks back. and did all test and said that you have problem only upto skin but not in body or in muscles and suggested medicne HCQS 600mg. foot swelling, left foot heel very pain, heap, vertivery and soulder very pain. sir plz kindely help me. Sir,m frm kashmir.i want to ask u about my mom.she is 45 years old suffering legs pain but only muscles.v consulted many doctors but can;t take relief.nw my humble request u r.pls suggest me what we do.my contact no is(09697091418)pls sir contact me soon. I am Nirupama Behera female (age - 26) suffering from joint pain after 12weeks of my 1st delivery. I am not sure if the reason behind my joint pain is arthritis or something else. The pain is un-tolerable while I am getting up from Bed, all most all the joints are swelling and paining like I am feeling like dying every morning. I have already consulted with homeopathy and they also recognized the cause of my pain as vata. I have already continued homeopathy medicine for more than 2 months but no result found so far. So now I am planning to go for Ayurvedic medicine treatment. My report of glucose, sugar, pressure etc are all normal. I am a breast feeding mother. Please feel free to call me (+91 9036 870 685) or contact me through email if any other information needed. My grandfather had pain in right shoulder.His bones of shoulder are crushed.Sir please tell me the suggestion to cure his bone. i am 32 year old and live in Aligarh U.P.I suffering from rheumatoid arthritis from past 6 years took allopathy treatment all those methotroxocin and hcq and medrol etc. but i result in side effect rather than cure. i face a bad and painfull morning every day. so kindly suggest me Ayurvedic medision and diet.thank you. Hello sir, I am 52 years old woman and for past 20 yrs i have been suffering from many illness after i have done hysterectomy and for past 7 yrs am having block in my brain, migraine, mastroid, urinary infection(20yrs), and now having severe knee pain with swelling for 4yrs...Can you suggest any remedies? my mother is suffering from arthritis last 4-5 years.and in these period i got her every treatment allopathy,homeopathy,and even 3 months baba ramdev medicines and even she ate some jadibuti as someone asked to do so but did not work anyone. and now a days her pain is increasing day by day.please suggest me some ayurvedic medicines as i heard that there is no side effect in taking those medicines. even i took her cmc vellore and got her treatment there almost 2-1/2 years.but it was the wastage of money and nothing else. finally she is taking ayurvedic medicines under the doctor's supervision. Sir i m suffering for Rheumatic Arthritis since three year Pls suggest me how I can I reduce my problem. I am suffering from arthritis pain from last 7 years. I am taking now Ayurvedic medicines last two years. I feel improve in my pain but in my no improvement i have too much pain in my foot. Plz suggest about my foot. i am very thankful to you. Respected Sir, I am suffering from Joint pains since 2years, I gone for Biopsy surgery also. After that I am taking treatment with the Dr. The Dr. says it will stay in your body some times then it will go. Daily I am taking the tablets even though the pain is same. If some times pain is more i take naprosyn 250. it gives me little relief After 3-4 days pain will be same. I have 6years son some times i am not able to put shoes for him, that much pain for. Plese help me suggest me how will i get re leaf from this. i am suffering in RA for last 7 years and under treatment, i tried homeopathy, ayurbedic and allopathy, but seems no medicine can cure completely, as there is no side effect in ayurvedic medicines, now a days i opted ayurbedic medicines. Digestive enzym is very important. ZYMACTIVE double strength up to three months is recommended. Marijuana seed extract is good. Ask me for further consultation. Neem oil + castor oil + turmrric + pepper heat it and apply. Dear Sir I am suffering joint pain my big problem is knee pain pls suggest me how i improve my problum. iam suffering from knee,sholders,elbow and finger pain from 4months i have taken more alopathy medicans but not taking any relife.doctor saya this vata problem pls suggest me the what i will do. she is taking shalki juice n some other ayurvedic medicines as given by Dr. Bansal. I am 25 years old suffering joint pains in the neck, shoulders, elbows, fingers nodes and knees and ankles. My RA factor is within normal range 9. Doctor had given the medicine with painkiller and HCQS and Disprin. I have taken tablets for 3 months but it reduces the pain temporary and again it starts. So next i tried ayurvedic and 15 days back took panchakarma treatment for 1 week and taking tablets till today but there is no relief in pain. So Kindly suggest me how can i get rid of this disease. I have RA for last 7 yrs. I had been taking Ayurved Meds. with very little result. I am in country where it is very cold. Now I have seen many people have got cured on TV. So I did my research and found that the food which triggers RA pain , some of it is opposite ayurved concept. Firstly , detox with celery and cumber juice. and water for 2 to 3 days. you have less good bacteria in your system. no coffee, or any sort of dairy. consume herbel tea. I am not a doctor but I am sharing what i know continue with your ayurved or other meds you will see the difference in few months. I am takingb treatment from Vaidya Devendra B Triguna based in Nizammudin delhi and also from SMita Naram of Bombay.So which ever you gusy can contact do it or any other known Ayurveda doctor. Strictly follow the diet plan they give and medicines. I am 46 yr old woman. I have been suffereing from waist, knee and ankle pains. When I sit for a while and try to stand up or try to walk it is very very paining. i hv been sufferin from left knee pain(rumarthereties) which is not comming from one particulour place .time to time pain place changing,like around the knee.i hv been went to 5 top doctors ,but no use.pain killers also not working.so any suggistion? I suffered from Arthritis for almost two years. Few month were so tough that i cannot walk to toilet. With painkillers and other medicines, i was able to walk but still i was never relieved of pain. Then my mother suggested that i should start doing Pranayam. So every morning i will switch on TV, Astha channel and from 5.30 till 7.30 am i will do pranayam and other small excercises as Baba Ramdev. And within seven days, my pain was gone. I still carries those medicines to remember those days. I still do Pranayam and always try to live a healthy life. You guys can try, as it worked for me, it may work for you as well. Wish you all a healthy life. my wife has suffering by rheumatoid arthritis for 3 years. she has take regular medicine but no relives from the pain and swelling. pl, tell me how can i improves my wife 's problem. thank you. I am Upendra Samuel (49Yrs,) since 8 years I am suffering from Arthritis, 4 years ago i got treatment at Hyderabad from Rheumatologist who suggested me with the medicines like ETOSHINE (90mg) TRIOM (20mg), HCQC, RECAL (500mg) METHOTREXATE / IMUTREX (10mg), FOLIC ACID (5mg) and ARAVA (10mg) but yet I am not satisfied and still i have pain in my Knee (both) and Elbow (both). Kindly suggest me any other medicines that it can heal my knee & elbow completely. I'll be ever grateful to you sir. sir please koi tretment batana. My name is karpagam .I am suffered rheumatoid artistic after delivery.Now my age is 22.I am suffered RA last three years(my RA factor is 18 iu/ml).I take English medicine last three years .That treatment will be managed but not cured.Now i take Ayurveda treatment in kottakkal Ayurveda sala at kerala . 1.My RA factor is normal or not? 2.Ayurveda treatment cure the RA? I need your valuable guidelines to further process. 1 am 28 yrs old.i have too much pain in my left knee.doctors said that i have infection in blood and also have swelling in my knee and i have RA Factor.my right shoulder was also stiffened but now i can move it without taking any medicine.but i still have pain in my right shoulder.kindly suggest me the best medicine.i have started a homeopathy medicine also but its not tht much effecting.its my early stage.i m suffering with this since 8 9 months.kindly suggest me best medicine to completely be free from this. I have arthritis on my right knee, I was having hard time climbing up and down the stairs. One day while reaserching I came across the forum where a member swore by turmeric powder. I have been taking half a spoon of turmeric with little bit of rice, salt and oil. I understand we need to add oil for better obserbant by the body. I add salt because turmeric alone tastes awful. I am pain free now, have no problem climbing up and down the stairs. I hope it will work for others too. Good Luck. Pl. post if it works for you. I am 32 years old male. I diagnosed as SERONEGATIVE ARTHRITIS. before a year and on Methotraxate 10 mg weekly once, salfasulazine 1gm BD, voceran 50mg BD PC, omeprazole 20mg OD empty stomach. In between during flare up I have been given soumedrol 500 mg IV. In winter I am struggling with a lot of pain in my Left shoulder, left elbow, right knee and chest. taking voveran helps for 5 hours maximum. Will you help me to manage pain and other treatment because I feel taking pain killers will not work a lot. My RA factor is negative, CRP Positive, ESR always >30, Anti CCP negative. Sir, My wife is suffering severe joint pains.Pain in Knee, ankle,shoulder to back bone.She is crying .since last 3 nights she could not sleep.doc.said there is some infection in urine.but now infection is 85% reduced even then there is no relief in pain. mornining when I get up from bed the pain is more. I am 55 years old . my father is suffering from knee pain since 90's. He is 78 now. Would you like to suggest ayurvedic medicine for him. I have knee pain since last 2 f year. after seating long i was feeling discomfirt and pain and i could not bend my right knee completely if I set long time. I am taking alopathy medicine i.e. jointac forte. but I am not full relief . I have full faith in aurveda some inflamation more than pain. When I will stand in the morning after few minutes I will be able to stand other my joint will stiffed ould you please guid me ? I am 33 yr old female. I have knee pain since last 1 n half year.sudden i feel pain in right knee , after seating long i was feeling discomfirt n pain.and i could not bend my right knee completely.after medicine for 8 months it did not get any improvementment and doctor suggest me for arthroscopy.after that for few months i got improvement but then again the same problem is happening.long standin and walking got pain.i even cant stand for more than 5 mins.pain is not continuous but sometimes some points in knee got pain.i have discomfirt and inflamation more than pain.my allopathy is still goin on.but i could not feel any difference.could you please guid me ? Sir, my son is suffering from arthrites problem,he is having pain in heel knees and finger joints, he is finding difficult to walk, he has decreased his weight by 12 kg for the last 3 month. His intake of food has been gradually decreased by one 4th. so pls can u give suggestion what proper treatement shall we give to him. My mother is suffering Arthrities (both leg knees) for the last 3 years. She is 62 years old. I have been consulted several doctors and all of them are adviced to done operation for it. But my mother didn't agree for operation.. In this situation, Please help me. I am looking forward a direction from you in this regard. I am very grateful to you. Respected sir, I am the student of B. Pharmacy, age 21 but not trust on allopathy as well as homeopathy & suffered from spondilytis.The HLA B-27 is present & I am completly bored by chemical treatment, so can you help me. Sir,please. It hurts so much to watch her in pain, yet cant do anything . Please sir, any kind of help to reduce her suffering is much appreciated. my wife has more pain at knee joints.which google medicine she should take for that?thank you for such information. thankyou. my mother is 64 years old she is suffering from artharites (goint pain) i took him more treatment but no efect after left the pain killer medicine . so please give me some advice for this. presently she is unable to walk easily and stamd more time also. my brother ki age 32 years hai.unhe last 1.5 years se right legs & fingers me pain hai.hum bahut treatment kara chuke hai but unhe thoda bhi fark nhi padta jab o bhaithe hote hai to dard kam rahata hai but jab o chalate hai to right legs me dard or shuny ho jata hai or foot ke uper ki nash compan karti rahti hai .sir hum bahut preshan ho chuke hai agar aap ke pass iska koi treatment hai to so please request sir iska treatment bataye. i too suffer from arthritis for the last 6years and have tried all type of medicines,but i would like to share one of my experience, i fasted for 9 days,first two days i had only pomegranate (dalimb) fruit in day time and papaya at night, the next five days i had lime water and honey as many glasses as i required for the day and then the last two days again i was on fruits,in this period i realised that my pain has reduced a lot, but after 10 days when i was on regular diet the pain again started.if any one wants to try fasting please go to some naturopath dr. for consultation.i am again going to start this fasting exersice and would let you all know the result. Last 18 months i am suffring by body stiffness at morning and heavy paining in left knee , wrist , shoulders and some time in finger joints.I was admited in jehangir hospital under treatment of Dr kering , he had done angiography of my kney and send sample for determination of R.A., but the result was negative. that time my URIC ACID LEVEL was 13. Doctor advice me to continue GAUTSTAC pills for next 120 days. Again i checked URIC ACID LEVEL , Which was 3.5. But still today i am suffring the same problem. WHEN I TAKE ANY PAINKILLER I FEEL NICE FOR SOME TIME , BUT AGAIN AFTER FEW DAYS THAT PAINKILLERS NOT WORKING AND USELESS FOR ME. SIR, PLEASE ADVICE, SUGGEST ANY THEORPY ,MEDICINE FOR ME. please let us know expert & experienced Ayurvedic treatment for Osteoarthritis. Sir, I am 40 years old female. Since last 4 months I am having pain in ankle joints and heels. Sometimes it starts paining even when I walk for 1/2 a km. and sometimes it does not pain at all for a couple of days at all. There is no bone deformity as per the x-ray report. But I have a medical history for arthritis as my mother suffers from it. There is pain in the ankle joints and heels and sometimes there is a burning sensation, but there is no apparent swelling seen in the area, and sometimes the heels seem to have hardened and are stiff. I have started doing some stretching exercises and yogasans under expert guidance. Can you suggest me some ayurvedic medicine to be taken for this problem? Thanks. I was very agile and flexible - a sports loving person. All of a sudden, one fine day about 3 years ago, my legs started paining and I was unable to move. My movements were restricted to extent that I was not able to walk even. With some ayurvedic medication I am continuing my routine life. I have found no total relief or freedom from pains. I am suffering joint pains in the neck, shoulders, elbows, forearms, fingers nodes and knees and ankles. If I stand or walk for 15-30 mins max. my legs starts paining, I am unable to move or walk. I need to sit for a while and than start again. This has been happening for the last two years. I have taken both allopathic, homeopathic and ayurvedic treatments, but it vain. My mother is 58yrs of age & suffering from accute pain in both knees since last 5yrs.knees are bending into bow shape now. Made a lot of treatments but I think doctors are just experimenting on her. i suspect she is suffering from knee arthritis when i read articles on knee pain & symptoms. Swelling also there in knee cap. I am not so rich to take her to big hospitals and surgery. please suggest me what should i do. My wife aged 60 years, is suffering from Acute joint pain at Knee. This is started about 4 months back. Pl. advise what type of medicine to take & if we would like to show you, pl. send your detail address & contact nos. Sir,I m 19 years old.from last two years I m suffered from RA air tab se main steroids le rahi hu,kya main puri tarah se kabhi thik ho paungi aur agar ha to use Liye treatment kya hai? I have rheumatoid arthritis for the past 10 years. There is pain in both the knees and right wrist region being unable to write. presently I am taking saicra glme capsules but it does not help. I also have digestion problem and whatever that is eaten during the noon is not getting digested. kindly suggest me an ayurvedic remedy. Hello sir,i m 33yrs old from last two years suffring from ostio arthrities,it very difficult for me to stand long hours.Kindky suggest any permanent solution for it. my wife is 30yrs old.she is suffering from arithritis.she is taking medicine sazo 500.but someone advise her to take ayurvedic medicine.is it fine to take ayurvedic medicine with sazo 500?she has swellen and pain in joints. so plz suggest me. hai sir, i'm 27 old gal. diagnosed rhematoid arthiritis last year. on moden medicine. still having pain. any ayurvedic medicine to control my disease. my father is 76.there is too much pain in his both the hip joints for last 2 yrs.he feel too much pain when he walk even for half an hour.his digest power is very weak. please suggest me the effective ayurvedic medicine. I am aged about 60 years and suffering from severe pains in shoulders, joints and stiffness & swelling in hand fingers and right leg toe since 18 months. Here Ayurveda Doctor told me that it is AMAVATA and giving medicines and no result is found. I am a diabetic since 17 years and is under control. R/A, A.S.O. & Uric acid tests are in normal condition. I am finding it difficult to walk due to pains in legs and unable to sit on the floor. Sir, please advise me as I am suffering a lot and spending sleepless nights. Dr. may waif have arthritisof the knees which is very painful. she his 61 years of age and she his obese.It is four years since suffering. Please advice. May I request you to suggest she permanent relief to knee pain? Iv been searching in vain for a remedy to help my mother who is suffering from acute artritis. It has affected all joints in her body and walking is limited. Doctors suggest knee surgery but she is 76 years old, and I cant afford so much money. She also has hypertension, water retention in her lungs, for which she is on daily medication. Is there any way u can help me ? prescribe me some strong medicine i belongs from kashmir it is coldest place too. I have severe pan on entire Back and neck and joints of fingers. Can you please advise me? I got blood test result was I have Artritis. Wondering if there is any treatments available??? My right knee, lower back and neck are affected areas!! my mother is suffering from joint pain so please tell me treatment and care. My mother's (48 YRS), E.S.R.has been increased to 32 mm / hour.According to recent diagnosis she is told to be suffering from arithiritis.How can she cure it apart from (first line n second line medications) allopathic medications ? I am suffering from Arthiris for 2 years.I had aurvedic treatment for 14 days Abinga.I felt relived again it started .I took 3 bottles of kashyam and tablets.Only left leg balancing is difficult.wt is 84k.g.ht 5'3'. 75yrs.I am scarred of knee poeration.please advise. My mother is suffering with SANDIVAT, i need your treatement procedure with fees and location. I am 60 years old male. I have knee problem since last 6 months. I have morning body stiffness my all blood test are normal except deficiency kindly suggest some medicine. Your above information is very useful. My husband is 47 yrs old, he is healthy but recently his left knee started severely paining and end of the day he feels feverish, and his joints become stiff,he was unable to walk properly but somehow took some medicines and his pain is less now.My question to you is that are these any symptoms of Arthritis or what ?if it is what is treatment and what diet should he take? Sir, my mother is suffering from arthritis and migrain problem can you please suggest me what we can do. hi, im 29 yrs old and im suffering from joint pain in my arms and legs..what should i do? am i not too young for that? Dr I have arthritisof the knees which is very painful. I am 54 years of age and I am obese.It is three years since Im suffering. Please advice. Yes the details given are true and the solutions work for many. I too Practice Ayurveda and I stay in pune. I have treated a Lot many people for different kind of problems. If any one intrested in taking the treat meant can try contacting me on 9273287874. Patients need to take appointment and only for saturday and sunday. I m suffering from ankolysing spondulytic. It can be treated with aurveda. A very good explanation and easy for people to understand. Suffing from Psoriatic Artheritis from last two years. Joint pains and back pain. Please suggest the diet and medicines. Thanking you sir for suggestion to do regular physical exercise as per capacity/limit of the concerned person. It is very interesting to read your message on Arthirties can i visit your clinic i am also suffering from leg Joint pain since last one year, doctor adviced due to Manopos and lack of calcium difficiency. What is the remedy if i take good calcium tablet it will be benifited or by good diet. pl suggest me. Arthritis problem of my mother very pain in joints and feel swelling please tell me nice medicines for my mother. 09887208840 please call me sir i am very poor help me my mother. ir meri mother ko artheries hai unhe chalne mein kaafee deekat hoti hai dawa ho raha hai per theek nahi ho raha hai aur body mein sweeling hai.SIR please koi slouation baatiye. Dear Sir, I am suffering from Rheumatic Arthrites last 5 year. I have taken many treatments for my arthrites problem but all in vain. Pls suggest me how can I improve my problem. my RA FACTOR IS 256.
sir meri mother ko artheries hai unhe chalne mein kaafee deekat hoti hai dawa ho raha hai per theek nahi ho raha hai aur body mein sweeling hai.SIR please koi slouation baatiye. VERY WELL EXPLAINED,EVEN A LAY MAN CAN UNDERSTAND THE WHOLE TREAMENT ,MEDICINE ,DIET, AND ALL THE PRECAUTIONS TO BE TAKEN CARE. A WONDERFUL JOB & KEEP IT UP FOR FUTURE TOO. GOOD SERVICE TO A SUFFERER AS WELL AS TO HUMANITY ALMIGHTY GOD MAY BLESS YOU WITH MORE PROFESSENALISIM.